Cloud computing conjures up all sorts of images (not to mention the opportunities for fun with headlines) but what is cloud and how will it help your business? If you swap the word ‘remote’ for cloud, you pretty much have it. 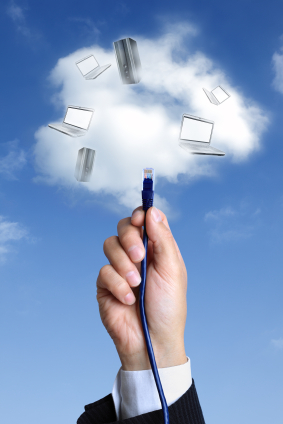 Cloud is about having some, or all, of your data and software off-site. It could be a server in your office, accessed by the staff there but also by dispersed team members. It could be a server at head office that connects all the other offices. It could be a server run by another company and rented by you. You may have software on your desktop and data in the cloud or you may have everything in the cloud. If this is the case, you only need a mobile device and an internet connection to work, which means absolute flexibility and choice about how, when and where you work. As with any technology, though, as well as the benefits there are also pitfalls to be wary of. We mentioned flexibility, so let’s start with that. Whether you are working on a desktop in the office, a laptop at home or a mobile phone in the field, you can access data and systems to work productively, collaboratively and securely. Documents are all in one place, not in several different locations, and can be worked on by more than one person, feedback incorporated and changes saved. With staff working in different locations and at different times, this could increase your ability to service clients’ needs outside of the normal office hours and respond more quickly to problems. Collaboration is not just about working together on the same data; it can be far more personal. Hosted services like Microsoft Lync can facilitate video meetings that can incorporate files and presentations, whiteboards for sketching ideas and responses and create a very interactive platform. Economy and scale are also important features. There is no cap-ex because you are renting and paying monthly, you are not reinventing the wheel with an expensive, bespoke software system (unless, of course, this is what you need) because the products you need are there already, some are even free: a small business could even start out with almost no cost, using Dropbox, Google Drive, Skype and similar. While these free (or nearly free) services may get a little clunky as you grow, if you have started with a paid-for service, it can just scale up as you grow, without having to fundamentally change what you have set up. One issue which can cause consternation is security. However, cloud security is likely to be far better than you could achieve in-house. Cloud providers have a vested interest in keeping your data secure, will have resilience and recovery built-in and back-up is automatic. Additionally, mobile devices are far more secure if they don’t actually have any data on them. And finally, what happens if there is a problem. Cloud is great for disaster recovery, because whatever happens to you, your staff, your premises, your devices – you will not lose your data. What does all this mean for your business? Great staff engagement, because they can work flexibly, great control of costs and data and great agility, all of which puts you one step ahead of your competitors. Unless they have already made the move to cloud, in which case you had better move if you want to keep up. And what are the pitfalls? As with any system, there are pitfalls to be wary of. Security is always a concern. While a cloud vendor may well be more secure than your own set-up, there are still risks from hacking and other sabotage. Security should influence your vendor decision: multi-site, back-up, power-resilience, etc. You are also dependent on connectivity, so this will influence your decision as leased broadband to improve performance and resilience is expensive (although installation could be free). While cost savings can be made and you are saved from cap-ex, there comes a time and a size, depending on your business, where a bespoke set-up may be more cost-effective and more flexible. As you grow, the original services may not grow with you. And anyway, a lot of services may come with very little support or instruction – you will need to look closely at SLA’s. It is important to start with the end in mind. Our advice is to figure out what you need to do and then get expert guidance. Then you can enjoy cloud, but without the pitfalls.